Our boys work hard all day and a 6.30 am start is not uncommon to commence due to a break in or act of vandalism from the night before. Our first job is at a corner shop and we come face to face with a distraught business owner who has his front window smashed. Our first task is to safely remove the broken shop front window and then measure up for the replacement window. Being a shop front they are generally very large windows, so we board up the broken window so the premises is secure and the business owner can at least commence normal trade. We will then have the replacement glass cut to size and we come back a short time later to install the replacement glass. We make sure the customer is happy, obtain their insurance details and do one final check to make sure no glass shrapnel is around by doing a final clean and sweep of the area. The next service call relates to a house that had a bedroom window broken by a flying soccer ball kicked by the grandkids. 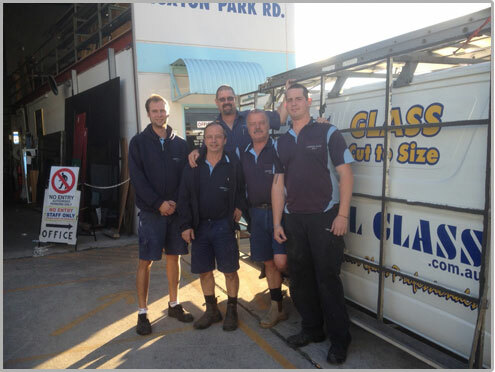 It is just a normal size window so we can cut and measure the replacement glass on site. We remove the broken window, clean up all the mess and install the replacement window. Given the replacement window cost was less than the customer’s excess on their insurance, the customer pays us on the spot, we issue a receipt and leave with a relived grandmother happy. The next job relates to a shower screen and mirror install at a newly renovated bathroom. We had previously measured up and were waiting for the tiling and painting to be finished, as glass is always last. The customer is having a frameless shower screen installed. We install piece by piece at a time, join them all together, make sure once installed there are no leaks and customer now has a beautiful frameless shower screen. We next install the mirror on the wall as a permanent fixture and now the customer’s bathroom is complete. We have 4 more jobs to finish off the day. They range from a broken window at the local RSL club, 2 broken windows on a company home that was being built in a newly developed area, replacing a broken bathroom window on a 5th floor unit and we finish off by installing a new mirror at a gymnasium. It is now 5.00 pm and after a long and varied day we go home, dream about glass and get up at 5.30 am the next day ready to do it all over again. We are addicted to Glazing! I don’t know whether this inspires you, makes you feel sorry for our boys or you think we are a bunch of workaholics – we love what we do, and it’s what we do for a living and couldn’t imagine doing anything else!